Takehiro Fukuda, 34, might have made detours on the path to his current job, which links professional baseball to science. Even before he reached the pro ranks as a pitcher at 26, he faced many turning points. It was academics, including sports science, that helped him continue the pursuit of his diamond dream. His pro career as a pitcher ended after just four years, but he was hired as a research specialist for NTT Corp.’s Sports Brain Science Project in January. And now, Fukuda is working in the world of baseball again — this time as a researcher. As a student at Otani High School in Kyoto, his passion was to play in the national high school tournaments held at Koshien Stadium, but that dream did not come to fruition. He spent a year preparing to enter Kochi University, and played baseball after enrolling in a six-school league in the Shikoku region while he studied sports science. He put up notable results in the league, but it did not open the door to his dream of becoming a pro. 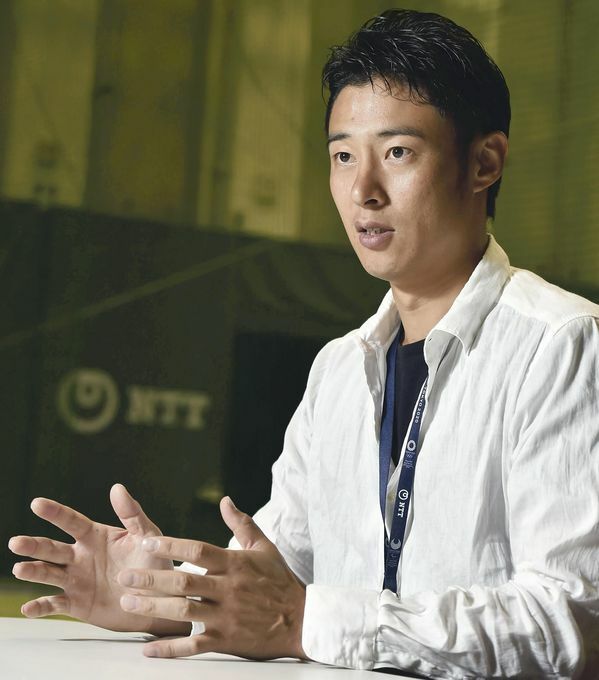 As a graduate student at Kyoto University, his baseball dream was rekindled. He learned biomechanics and motor control from Shingo Oda, now a professor at Kansai University’s Faculty of Health and Well-being. Said Fukuda: “When I was a senior at Kochi University, I got to know Oda, who worked at Kyoto University at that time, through a book that I read. I dropped in on him without an appointment, but he kindly told me that he enjoyed meeting people like me because he feels their enthusiasm. He had continued playing baseball while at graduate school on a club team, so he decided to give going pro one more shot, consulting Oda and others before making the final decision. After taking leave from school, Fukuda joined the Kagawa Olive Guyners of the independent Shikoku Island League Plus. Fukuda began playing baseball when he was a second-grade elementary school student. His father took him to a school one day, and members of a youth baseball team happened to be there. Fukuda made his NPB debut in a game against the Hanshin Tigers at Yokohama Stadium on Aug. 19, 2010. Said Fukuda: “I was so nervous at the time, but I was also so happy. The first batter hit a grounder to third. The third baseman was [Shuichi] Murata, who I had seen on TV many times. “Murata took the grounder and threw it to first base. Watching that scene, I was hit by the thought that I was in the world of professional baseball. That is the moment I remember most clearly,” Fukuda said. Murata now belongs to the Yomiuri Giants. During his four-year career with the BayStars, he appeared in 25 games on the first team, but ended up without a decision. Fortune no longer smiled on him — he achieved good results as a starter on the farm team, but he was made a reliever on the first team and failed to put together tangible numbers. “I wanted to play longer, but I couldn’t,” Fukuda said. “It was probably because the [usual] professional baseball player is like a mountain that is one size larger than me. The height of my mountain might have equaled that of other players, but I think other players’ mountains were bulkier than mine. After retiring, he studied sports science at a Waseda University graduate school while working for an accounting firm. The NTT Sports Brain Science Project was established in January, and he was appointed to his current post that same month. Located in Atsugi, Kanagawa Prefecture, this research institute aims to enhance athletic performance. Its research includes how to better control the body and how to skillfully manage one’s mental approach. Fukuda’s current area of study is pitching-control skills. “There is no other researcher who has experience in the world of professional baseball,” he said. “I’m interested in the difference between people who were successful as professional players and those who weren’t. In pro baseball, pitchers don’t defeat hitters because they throw fast pitches, and hitters’ batting averages are not high because the speed of their bat is fast.